a self-looping device that generates low frequency control signals based on what you 'draw'. To use this module simply draw your own LFO patterns in real-time by dragging the Draw fader. Draw LFO is ideal for creating your own wave-shapes to modulate any parameter on another module (cutoff, resonance, amplitude and so on). Draw: Drag this control to draw your waveform. Simple but dsp-wise “cheap” LFO with “Wheel” (=amplitude) control. Retrig input. a low frequency oscillator that offers a selection of 128 different complex waveforms. 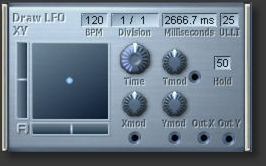 It can be tuned by HZ or BPM and has a retriggering function. older version of the above, with less dsp load.